Photo courtesy of James Payze. 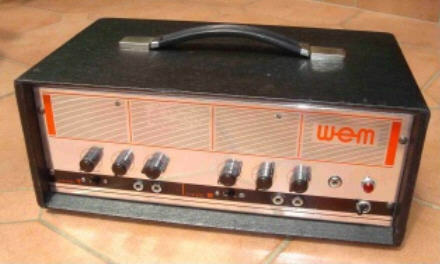 The ER100 was the largest guitar amp in Wem's range in the late 60s. It was a Solid State amplifier. Controls were identical to the ER40 : 2 channels each with 2 inputs, treble-boost slide switches, and bass, treble & volume controls. Recommended speaker cabinets were the Starfinder 100 Twin 15, Super Starfinder 4 x 12 or Starfinder 100 Bass.